When Jamaica's Usain Bolt and Canada's Andre De Grasse crossed the finish line at the 200-meter semifinal, Bolt came in first and De Grasse in second, but both men were smiling. A photo of Bolt pointing and smiling at De Grasse has gone viral, with many people on social media trying to guess just what was so funny. USA Today reported that De Grasse said something to Bolt as he gained on him, causing both of them to laugh as the race came to an end. But what exactly did Bolt say? 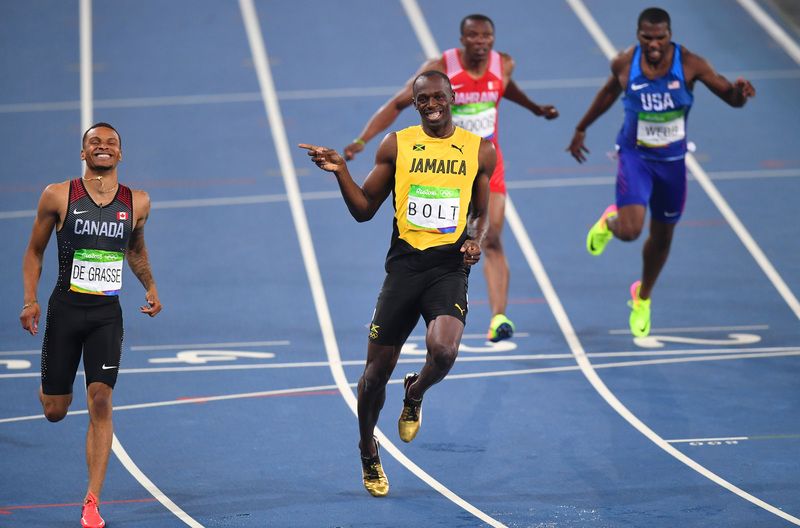 During the 100-meter semifinals in Rio, Bolt looked to his left and right as he was running, as though posing for photos even though he was in the middle of a race. When he did this, there was nobody next to him; he was well ahead of his opponents. But, as it turns out, he's not the only one who can smile while running. When he looked around during the 200-meter semifinal, he was in for a bit of a surprise — De Grasse was right there, grinning, and not far behind as Bolt might have expected. Bolt commented on the exchange in an interview after the race, saying he asked De Grasse, "What are you doing, it's a semifinal." But De Grasse had his reasons. "I don't think he expected me to do that," De Grasse told CBC after the race. "I want to push for gold, and even if I don't get it, I got to push [Bolt] to his potential, his limits and see what he has left." We might know what Bolt and De Grasse said to each other, but that doesn't make the exchange any less amusing — and it didn't stop people on Twitter from coming up with hilarious memes and captions to describe what went down, either. Bolt and De Grasse's epically photogenic moments have also caused a lot of excitement about their apparently blossoming bromance. It seems Bolt has finally found someone to match his aggressively-smiling-while-sprinting abilities. And to top it all off, Twitter has found the perfect hashtag: #DeBolt. Both men have qualified for the 200-meter finals, so maybe we can expect more smiles on Thursday as they approach the finish line. After all, if the semifinal was any indication, De Grasse has no intention of making this easy for the fastest man in the world.